During the night, this caterpillar (Oxytenis modestia) moved onto and began feeding on a leaf directly above the nest of a rufous-tailed hummingbird (Amazilia tzacatl), whose comings and goings disturbed the caterpillar, causing it to expand and reveal its "eyes" and rear up into its snake-mimic posture. Credit: James Marden. 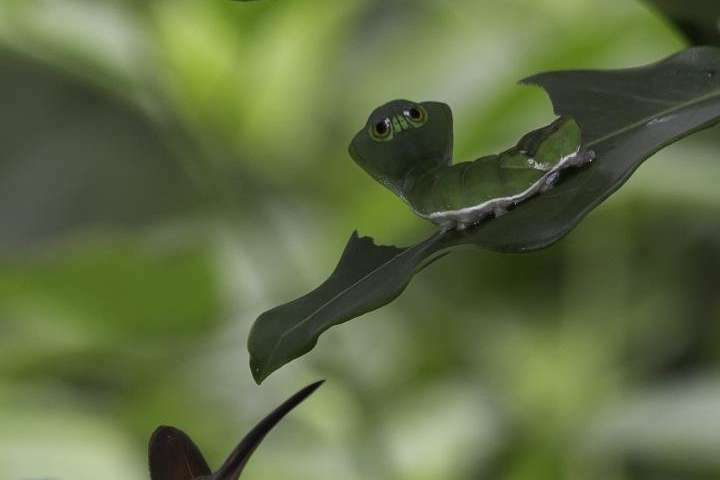 This is exactly what happened in Costa Rica earlier this year, when researchers witnessed a hummingbird defending its nest from what it interpreted to be a snake, but was actually a larva of the moth Oxytenis modestia. The encounter is described in a new paper published in the Ecological Society of America's journal Ecology. These moths—sometimes called the dead-leaf moth or the Costa Rica leaf moth—resemble flat dried leaves as adults. The caterpillars can inflate the top of their heads to expose a pair of eyespots. When disturbed, they raise their head up and move from side to side, increasing the snake-like appearance. In particular they resemble a green parrot snake, known to prey on nesting birds. The attacking hummingbird's nest with eggs was about 10cm away from the caterpillar in a small tree. When the researchers went to look for an assumed snake, they instead found the caterpillar feeding on a leaf immediately above the nest. "Hummingbirds have a few stereotypical styles of flying: visiting flowers, preying on swarms of tiny insects, chasing each other, and mating/territorial display flights," says lead author James H. Marden, professor with the Department of Biology at Pennsylvania State University. "Mobbing behavior directed against a threat to their nest is much less common but distinct and easy to recognize if you know their other flight behaviors... One can recognize this from a distance and only notice the source of their agitation upon close inspection." A bite directly on the false eye. Credit: James Marden. The interaction took place on a strip of secondary growth between the Pacific and primary rainforest on the Osa Peninsula, Costa Rica. The authors believe that the comings and goings of the female rufous-tailed hummingbird (Amazilia tzacatl) around its nest may have disturbed the caterpillar, causing it to expose its eyespots, which in turn prompted the hummingbird to defend its nest using what is referred to as 'mobbing behavior' by birds—darting flights and pecking at a threat, commonly snakes. The caterpillar was unable to feed during the 26-minutes of nearly continuous attacks. Most of the bird's movements were cautious and exploratory, but included quick thrusts to peck or bite the eyespots. 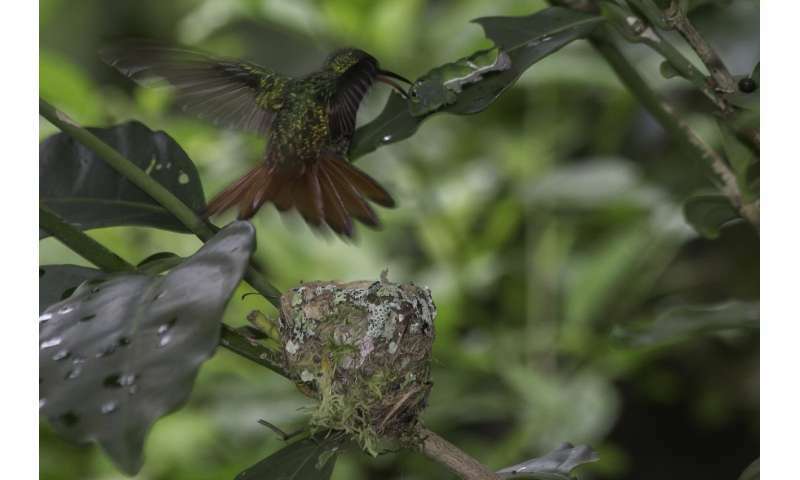 Marden stated that it was difficult for either the bird or caterpillar to disengage from the standoff, with the hummingbird protecting its nest and the caterpillar just trying to finish its leafy meal. "A snake-like creature so near to its nest was too much of a distraction or threat to ignore for very long," he explained. "The caterpillar seemed more irreversibly committed. When a camouflaged animal reveals itself as threatening, it is committed and cannot easily go back to camouflage. Hence, I think that it had no choice but continue looking like a snake until the threat had passed." 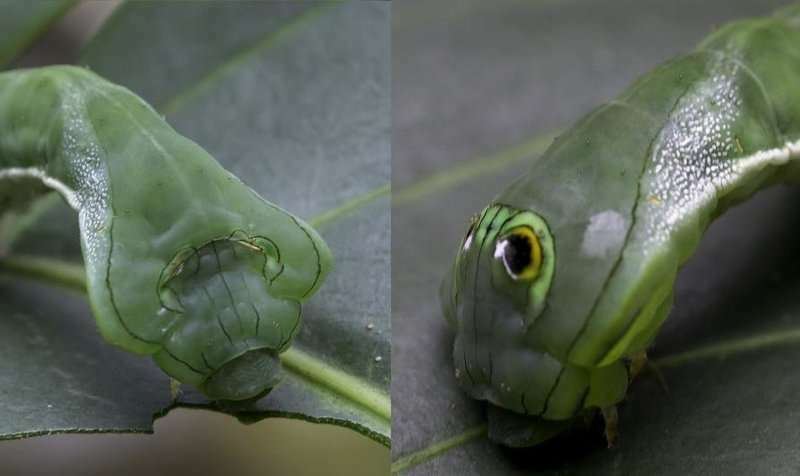 When disturbed, the caterpillar increases its internal pressure, causing the area behind the head to expand and expose a pair of eyespots. Expansion and exposure of the "eyes" is accompanied by rearing up and side to side movements, which closely mimic a small snake. Credit: James Marden. When birds exhibit this mobbing behavior targeting snake's eyes, it often ends with snakes being killed by repeated bites and pecks near the head and collar area. As for creatures that mimic snakes to protect themselves from being eaten, can they in turn protect themselves from this mimicry backfiring, such as in this encounter? Because the hummingbird behavior was typical anti-snake behavior, it can be considered replicable. "You'd want a cylindrical shape and green color, with the ability to rear up in the front and reveal an eyespot," he outlines. It should be remote controlled, light enough to attach to a leaf or stem, and wireless. "Many experiments have done this with clay or similar material, but those models lack the ability to combine eyespots with movement and behavior. That is what a robot could add." The day following the initial encounter, the researchers found the caterpillar feeding on a leaf on the same plant, as far away from the nest as possible. It had some marks by the edge of the right eyespot that may be beak marks—apparently the caterpillar learned its lesson.